Last week, we shared our interview with a liver transplant recipient who is living out her dreams post-transplant. 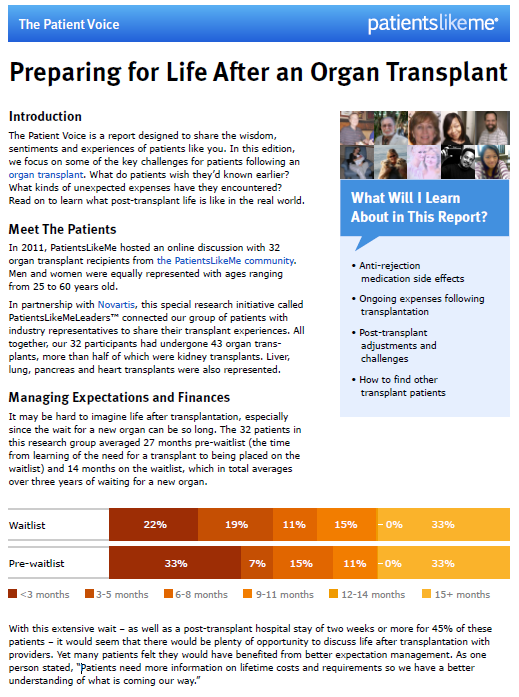 Today we’d like to add the insights of 32 organ transplant recipients who took part in an online discussion hosted by PatientsLikeMe. Split equally in gender with ages ranging from 25 to 60 years old, our discussion group reported 43 organ transplants amongst them, more than half of which were kidney transplants. Liver, lung, heart and pancreas transplants were also represented. What did these 32 patients have to say about life after transplantation? What do they wish they’d known earlier? From anti-rejection medication side effects to ongoing expenses, we’ve collated some of the key themes from this eye-opening discussion in a new report entitled The Patient Voice: Preparing for Life After an Organ Transplant. If someone you love is awaiting a life-saving transplant – or you’re a transplant candidate yourself – don’t miss this collection of real-world tips, experiences and checklists. Also, please share this free report with anyone who might find it useful. Do you know someone living with a mental health condition such as bipolar II disorder, alcohol addiction or major depressive disorder? Check out our previous report about getting the most out of inpatient therapy (hospitalization). Great Post!! Your post preparing for life after an organ transplant is really very good. We should mentally and physically be prepared for life after organ transplant.